As part of our regular Money Monday episodes, The “core concepts” series will introduce each of the fundamental pieces of the online business / blogging puzzle. With a focus on business elements that apply to any online business. Regardless of your niche, we want to provide incredible value in helping bloggers and business start ups get the best possible start and advantage for their online career. As well as regularly focusing on universal online business concepts, the other key change is the episode show notes. We are creating show notes that actually explain in detail the concepts we talk about in the podcast. We also aim to offer some useful PDF downloads that will help you action the concepts included in these episodes. The Usual link / mentions from the show are at bottom of the show notes. 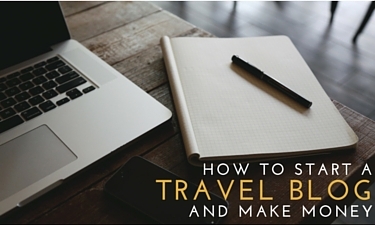 This cheat sheet and checklist accompanies episodes 052, 056, 058 of the travel freedom podcast. Instant download. No spam, we pinky promise! Blog Startup Cheat Sheet Checklist (Part 2) will be Available on release of Episode 060 on November 2nd 2015 – Where we talk all about growing your email list faster. It’s easier to show you than to explain in words. The system we use to build all of our landing pages is called Optimizepress and they, of course, have a landing page of their own built using their system: Take a look at the Optimizepress landing page. Unless you have been living in a wifi-resistant bubble, you have probably seen these sorts of pages. They are often the homepage of a company who has a specific product to sell. You may read a blog post and then click through to see the “Free report” on offer and hit a landing page. One purpose and no distractions – Often sidebars and menu bars are removed so readers don’t get tempted to click away from the page. This may seem annoying, but it makes readers more likely to read rather than leave. Follows a flow of benefits. The order in which content appears on the page takes the ready on a journey towards making a specific action. Great design. People like things that look professional. They trust them more too. If your landing page looks shoddy, readers will assume your product is low quality. Using videos / images / graphics to capture attention. You don’t have to use all of these things but you can test what sort of landing pages work best for your business. They increase conversion. Pure and simple. Want to get more people to opt-in to your email list? Landing page. Want to sell more e-books? Landing page. Want to get more clients to buy a course? Landing page. You still have to get people to your landing page. We’ll be talking about how to do that in later episodes. But you need those pages in place if you are going to get the best results from the traffic you get. Why get landing pages early on? A good reason is email opt-ins. If you are getting small traffic to start with, you need to work even harder to get anyone on your list at all. If you are building a brand new blog or website around a product, then a good landing page from day one is essential to create authority for your product. A lot of bloggers start blogging with an idea of what to blog about, but not a plan for what to sell or why people should sign up to their email list. If you do these things from day one you will be successful more quickly. Why we use Optimizepress to build our landing pages and manage blog themes. Styles of landing page have evolved and improved over the years, from the clunky sales letters that were just a lot of text, to the flashy, modern landing pages that wow with simple, benefit driven language and graphics. Optimizepress is more than just for landing pages. 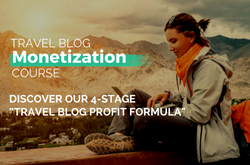 It can also act as a clean, professional blog theme – as seen on our site Backpacking 4 Beginners and it can build membership sites – so you can keep your best content for subscribers or customers. As a landing page designer, it is built as a simple drag and drop page builder. Pre-designed page elements look great and work well together. Everything is customisable, or you can just edit pre-made templates. Most importantly for new business, Optimizepress is very affordable at only $97 per year for the 3 site licence. The basic licence is fully functional too. There are 3 top contenders for the landing page market. But here are the pros and cons of why we chose Optimizepress over the other two. It’s cheaper, especially if you have 3 sites or less. It’s $97 per year for all features and the 3 site licence. lead pages is $300 per year and with limited features at that price (more expensive options available). We have the 10 site package, which is $197 per year. Still cheaper than lead pages. As we said, It can run your whole wordpress website, including your blog theme. Not just for building single pages. You can see that in action on backpacking4beginners. You can build any sort of landing page – drag and drop, its done from wordpress and all the elements like tick boxes, icons and more are included. You can add optimizepress elements, like opt-in forms, to any blog post using the optimizepress button in the blog post editor. its really simple. Sitewide settings for managing your blog. Add logos, change colours and fonts with one click and the whole site updates. Automatic optimisation for Mobile – lead pages has this too, but it’s good it’s included so your site will display correctly on mobile. Less free templates than lead pages – you get a bunch of basics and then have to pay for extras. But, you can make 100% custom designs from the large array of standard elements easily. Not quite as easy to use, but still easy. A little bit of a learning curve but training videos are actually built into the elements of the interface so you can learn as you go. Not quite as pretty. Unless you have some coding knowledge to customise your pages, you are stuck with all the standard elements. They are on the whole really good, but not quite as good as lead pages. Still, Optimizepress powers a lot of big sites, it is still very well styled and professional looking. Although Optimizepress provides a great, clean and simple theme, you may want your site to be much more unique and personal. For our personal blog http://foodfuntravel.com we have a theme that works a little like Pinterest – because we like pinterest. The site is a little overwhelming for some people – with so much eye candy to click on. But the craziness sort of matches our creative personalities, so we like it. We use Theme Forest for all our themes, as well as for a lot of stock graphical elements, stock music and other bits and pieces for design – like Facebook templates. It’s a large collection of out of the box stuff that you can simply implement into your new blogs and sites. All the themes let you see ad test a live demo so you can poke around and figure out if the functionality you want is there. Good mobile responsive themes cost about $40 to $70. One off payment with updates going forward. Obviously it’s not free, but the themes at this price point are generally much better than the free ones. Have a basic plan about how site structure. By this I mean, get a big piece of paper and write down all the menus, sub menus and types of pages you will feature. Will you just need blog posts? Or will you need portfolio pages and image galleries? Or a focus on video? How will these link to your home page? Doing a diagram on paper lets you decide how your blog posts and landing pages will all connect together. This may be something you actually want to spend a few days planning before you jump in. Once you know this you can inspect how each potential theme works to see if it has all the functionality you’ll need. If it doesn’t, you’ll either be compromising later, or paying a coder to customise the theme. Not ideal in either case. This is more than just clicking to see what it looks like. You can inspect every type of page and even various colour schemes by using the live demo function in theme forest. So go through and make sure everything behaves how you need. The more inclusive functionality, the better. In fact, playing with live demos you might find out that your potential theme will do more than you’d planned for and you might even get some extra inspiration from that. But, stay flexible. Do the menus and sub menus go to 2 levels, 3 levels? or even 4 levels. As your site grows you may have lots of content to sub-categorise. If you are new to this all and installing your own theme, you’ll want instructions that explain how all the customisations work so that you can make the changes you need. Most themes have graphical user interface these days, so no coding, but you will want to know exactly what each checkbox and option in the theme control panel does so you can quickly set up your site. Adding your theme to wordpress is a 3 button process. But google “How to install wordpress theme” if you have never done it before. You may already have a theme you like. If not, it’s time to get one 🙂 Try out Theme Forest. We blogged for 18 months before we discovered Optimizepress. Now, we couldn’t imagine our sites without it. It’s just so much more professional looking and effective than having regular blog posts as landing pages. You can take a look at how Optimizepress works on their site. 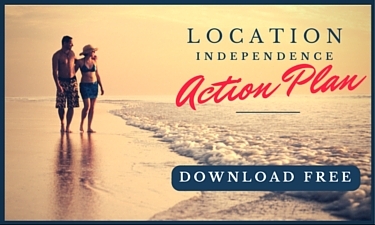 This action plan and checklist accompanies episodes 052, 056, 058 of the travel freedom podcast. Optimizepress – The easy way to create landing pages, sales pages and membership portals inside WordPress. Backpacking 4 beginners – Home page built with optimizepress. Check out blog pages to see what optimizepress does as a theme. 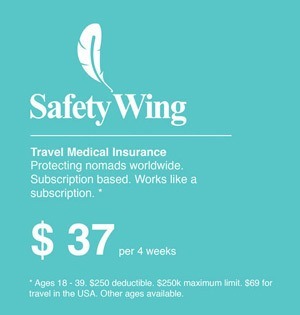 Five Dollar Traveller – Our personal blog with Flying News Theme from Themeforest. Why not pin it to your favourite blogging/business Pinterest Board?